Monday, March 23, 2009 Posted by Stephanie H.
When it comes to using your outdoor fire pit, you want to make the most of it. You plan on spending many nights with family and friends relaxing around it – so you want it to work at its maximum capacity. Should you burn wood or should you have a gas fire pit? There are many factors that will play into your decision, and it is important that you make the one that will suit you best. 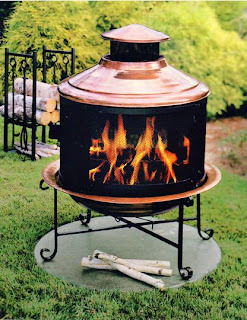 Most outdoor fireplace can be used as both gas burning and wood-burning. Many of them will give you the option of which way you would like them to be set up when you place your order. Most people enjoy wood-burning fireplaces. There is nothing like the smell of wood burning or the crackling noise it gives as it burns. While it can bring back past memories of camping and other outdoor activities for some, it can be a hassle for others. For starters, you will need to gather your own wood and make sure that it is dry and properly seasoned so it will burn well. Secondly, there is the clean up factor. You will always want to clean up after your wood-burning fire pit once the ashes have cooled down. It is not a good idea to keep burning fires over the previous fires remnants. However, if you love the sound and smell of a “real” fire, then you definitely want to have a wood-burning fire pit. You will also always want to be careful when using your wood-burning fire pit. Sparks can stray and you definitely do not want to be in its line of fire. 1. Check local ordinances regarding outdoor burning. 2. Never use lighter fluid or gasoline to ignite your wood. 3. Make sure to burn only seasoned wood. Although a gas fire pit lacks the reality of a true fire, it can still put out a very convincing flame. However, a gas fire pit will heat consistently, unlike a wood-burning fire. Maintenance is minimal compared to all the work that goes into taking care of a wood-burning fire. The convenience of it is what makes it so appealing to many people. Anybody who enjoys the warmth and ambiance of flickering flames, but doesn’t want the hassle of buying wood and cleaning ashes should consider a gas fireplace.